“My art teacher says that a real artist bleeds for her craft, but he never told us that blood can become your medium, can take on a life of its own and shape your art in vile and gruesome ways. I shove my hair over my shoulder, puncture my forefinger with the sterilised safety pin i had tucked in my pocket, then position the final glass gem on my mosaic and wait. As I press the translucent bead into the wet, white plaster, I shudder at the seeping sensation. It’s like a leech at the tip of my finger where I touch the glass, sucking and siphoning my blood to the underside of the gem, forming a pool of deep, velvet red. But it doesn’t stop there. Since stepping into the rabbit hole last year Alyssa’s life has never been the same. She tapped into her Netherling side, saved her mother from the asylum she had been stuck in since Alyssa was young and has had to hide it all from her boyfriend, Jeb, her best friend Jen and her father. With Morpheus, one of the fairies from Wonderland, invading her dreams its becoming more and more difficult to ignore the sensation that Wonderland is struggling without her,and soon she will find herself in deep trouble and find that running from Wonderland doesn’t work; it soon catches up. This is the second book in the Splintered series by AG Howard and in ways I thought it better than the first, and while reading I was desperate to know if there would be a third. The magic and mayhem of Wonderland from the first book comes crashing into the real world for Alyssa in Unhinged and soon everything she thinks she knows becomes just that. The story is fascinating though I did think it took its time to really start up. There is a lot of descriptive language used throughout both of these books and whilst that is fantastic for picturing the magic within the pages, it can drag things out a bit too much. 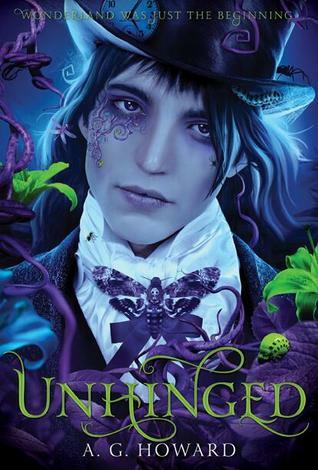 I really struggled to become engrossed in Unhinged and if it wasn’t for the first book being incredible I could have easily put it down towards the beginning of it. The story didn’t really start until things about some of the characters are revealed almost half way through and while I knew certain people were hiding things and that there had to be a reason for this stuff happening to Alyssa, I wasn’t overwhelmed with it all until later on. Once that all kicked in though I was kicking myself for even thinking this was yet another contender for ‘second book syndrome.’ I loved where the story went to and what came to light about Wonderland and everything previous to Alyssa’s own trip. One of the main things that keeps me from adoring this set of books is the love triangle. I hate love triangles and it makes it worse in this series because I cannot stand Morpheus, one of the guys in this triangle. Jeb is so much better and such a nicer, more trustworthy person and I don’t understand why there is any attraction to Morpheus from Alyssa at all… or at least I didn’t. This book explains things a little more about why Alyssa feels the things she does and that made me come to terms with the love triangle a little more. I still hate it and I still cannot abide Morpheus, but I can deal with the triangle. I think there was a lot more fighting going on inside Alyssa in this book, more so than the first, which made her a better character and made the story better too. My thoughts as I read Unhinged went from ‘this better be the only sequel in this series, there better not be a third book’ to ‘omgosh, there has to be a third book, not everything is covered and I need more, this story is incredible.’ The last 150 pages were read way quicker than the previous 250 and my heart was racing as I read them. I knew as soon as I read the last chapter that there would be a third book but then sighed with relief when I went on Goodreads to find that confirmed. I seriously love this series more than I thought I would and definitely recommend it to any wonderland fans out there. Unhinged was published on January 6th by Amulet Books. My copy was sent to me from the publisher in exchange for an honest review. I am one of those Wonderland fans and I, too, loved this book. Fantastic review!